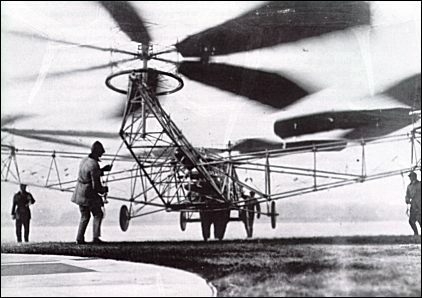 Description Dr. Bothezat constructed a vertical flight machine in 1922 for the US Army Air Corps. It was built around an X-shaped structure with a 6-bladed rotor at the end of each of the arms. The machine made around 100 flights and achieved a maximum hover height of 11 feet. On 18th December 1922 it remained airborne for one minute and 42 seconds. It also held a payload record by lifting four people and the pilot. However, the machine was very difficult to control and the army, which was more interested in autogyros, stopped funding the project. Dr. Bothezat constructed a vertical flight machine in 1922 for the US Army Air Corps. It was built around an X-shaped structure with a 6-bladed rotor at the end of each of the arms. The machine made around 100 flights and achieved a maximum hover height of 11 feet. On 18th December 1922 it remained airborne for one minute and 42 seconds. It also held a payload record by lifting four people and the pilot. However, the machine was very difficult to control and the army, which was more interested in autogyros, stopped funding the project. Do you want to comment the Dr Bothezat Helicopter helicopter?